MORGAN PARK — Straight from the Go‘s PeaceFest will take over the auditorium of Morgan Park High School from 3-5 p.m. Wednesday. Named for the T-shirt campaign started by senior Raven Smith, Straight from the Go PeaceFest will begin with a short film that features interviews with students and police officers. “We are trying to bring together unlikely allies to release peace in the communities,” said Smith, 17. Smith worked on the event along with seven classmates from the neighborhood school at 1744 W. Pryor Ave. Together known as the Straight from the Go committee, organizers of PeaceFest will also host several breakout sessions with students, police, teachers and other adults. The idea is for all parties to speak openly about how they feel about each other, Smith said Monday. She added that the free event will also include entertainment by way of student-led skits, solo dance performances and more. The whole effort is part of a competition called the Aspen Challenge — a student-led effort that aims to solve global challenges. On April 27, organizers of PeaceFest will present their program to a panel of judges at Soldier Field. The top teams are invited to present their work at the Aspen Ideas Festival held annually in Aspen, Col. The Bezos Family Foundation supports the Aspen Challenge. The charity is run by Mike and Jackie Bezos, the mother and father of Amazon.com founder Jeff Bezos. The pair started the foundation in 2000 using stock proceeds. This is the first year that the Aspen Challenge has come to Chicago. Smith, a Roseland resident, has been making headlines this year with her clothing line that relies on the phrase Straight from the Go. The campaign aims to combat the negative and often violent images increasingly associated with the city nicknamed Chi-Town, The Chi and even Chi-Raq. Smith and her friends prefer the nickname The Go. And her shirts — designed to resemble the Chicago flag — aim to promote a more positive image. The top-ranked Morgan Park High School Mustangs boys basketball team debuted their classmate’s shirts during pregame warm-ups Dec. 26 at the Proviso West Holiday Basketball Tournament. Smith’s effort to rebrand the city has also led to a resolution that will be read aloud during Wednesday’s City Council meeting. Eraina Smith, Raven’s mother, made sure her daughter’s idea was trademarked and helped launch the website. 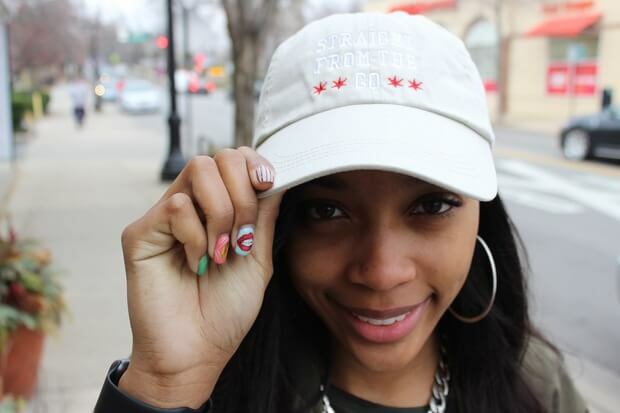 Besides being sold online, Straight from the Go T-shirts and hats can also be bought at The Shop 147 at 7225 S. Stony Island Ave. in South Shore and Belle Up, a maternity and women’s clothing store in Beverly and Downtown on the Magnificent Mile. Smith donates a portion of the proceeds from her clothing sales to various causes. She made her first donation March 5, $250, to her alma mater, Poe Elementary School in Roseland. She also plans to donate to the 100 Club of Chicago, which provides financial assistance to families of first responders who have lost their lives in the line of duty. Future donations will also be made to police groups looking to provide financial incentives to individuals who provide important information on violent crimes throughout the city, Smith said.